I’m excited to be sharing projects using the Unity Stamp Company sentiment kits today. I have this card with a simple layout to share. Super easy to recreate with any stamp set. I’m using two sentiment kits for this card. I really wanted to use that gorgeous floral heart from Beautiful Life Blessed Memories, but thought I’d use a different sentiment. 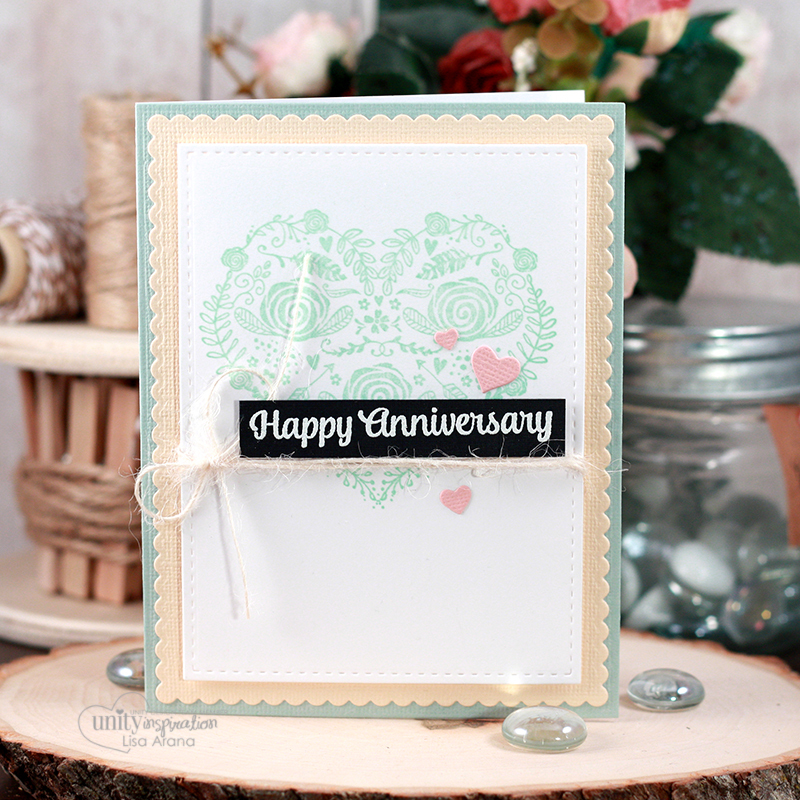 I absolutely need to have anniversary cards in my stash. Makes it easy to grab one when I need it. So, I paired the sentiment from Love is a Magical Thing. I love how all of these kits are so easy to mix and match. I was perusing Pinterest again looking for inspiration. I’m pretty sure this one is inspired by my amazing team member Heather Hoffman. I didn’t save the inspiration (I recreated it from memory) and I can’t exactly find which card inspired me. That said… even I still CASE (Copy And Share Everything) cards. Sometimes it is too pretty not to create a version of my own and it is a fun way to learn new things. I’m using a soft color palette this time, but you could mix it up easily. Add a bit of simple patterned paper where the scalloped panel is or go big (with bold colors) or go home. Haha. The main focus is on a big solid or semi-solid image that can take up the space on the center panel. You could easily stamp something and color it too. That would be fun. Then, just add a bit of a bow, a sentiment popped up and some little elements (little die cut hearts, stars, Nuvodrops or sequins) to call it done. Cover a standard sized A2 cardbase with cardstock. 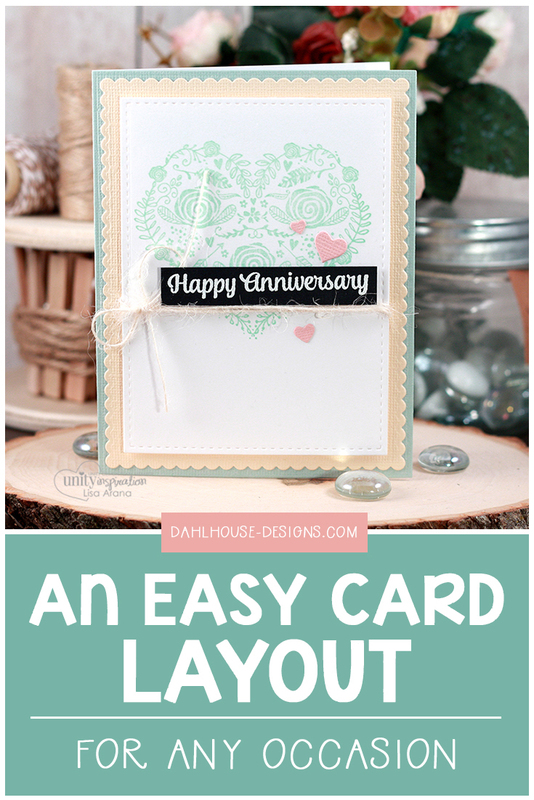 Die cut a scalloped panel of lighter cardstock and glue to the card front. Then die cut a piece of white cardstock and stamp with floral heart image. Repeat stamp with the MISTI to get a crisp image (optional). Tie some string around the center of the panel and then pop up on the card front. Stamp sentiment with Versamark ink and emboss with white embossing powder on black cardstock. Trim down to size and pop up above the string. Die cut some pink hearts, glue to the front and call it done. Unity Stamp Company Wanna Sketch Highlights Wanna Sketch? Beautiful card Lisa. I love both of those kits! Thank you for such detailed information on “how to” make this. Such a sweet colour combo Lisa, I love it!